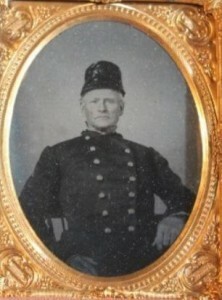 Captain Pitcairn Morrison was assigned as Emigration Agent for removing the Seminoles from Florida. He arrived in St. Augustine in November 1837, two weeks before 20 Seminoles escaped from Fort Marion, which was the old Spanish fortress. At Fort Marion, many of the Seminoles were ill, including Osceola, and Capt. Morrison himself was very ill from late 1837 to the middle of 1838. The old fort in St. Augustine had been condemned and declared uninhabitable by Army Engineers right before the war. The Seminoles were moved to Fort Moultrie, South Carolina where it was believed that the healthier climate would be beneficial for their health. Above: A picture of Pitcairn Morrison showed up a few years ago when he presentation watch showed up on an auction. Morrison’s career was not very good when it came to handling Indians. In 1861 in Arizona territory, Colonel Morrison sent a young officer, Lt. George Bascom, to negotiate with Apache Chief Cochise, which became known as the infamous Bascom affair. Because Bascom totally mishandled things, it led to 25 years of warfare with the Apache. In late 1837, Morrison hired Dr. Frederick Weedon as attending physician to the Seminoles (and for himself.) 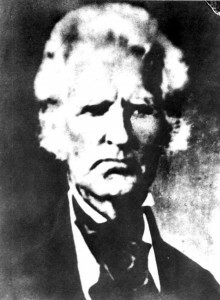 Weedon was former mayor of St. Augustine, at one time a militia officer; but most famous, or infamous, as the one who removed Osceola’s head at death. I have the honor to transmit a copy of a contract enclosed into with Doctor Weedon to attend to the Indians at this Post. It was the best contract I could make as no experienced physician could be had for a less sum. According to Dr. Weedon’s surviving notes in the Alabama archive, when Osceola died, Capt. Morrison insisted that Osceola’s items be removed and sent to Washington. The Army and Navy Chronicle says that these items were given to Major J.H. Hook as personal gifts from Morrison, who had a large collection of Native American artifacts, which he apparently had collected during his tenure as Commissary of Subsistence Agent, to provide for feeding the Indians during removal. (Seems like Hook is the one who benefitted from the contract!) What Morrison did by plundering these items from Osceola’s body and giving them to Hook was clearly unethical, and these days would have gotten him court martialed and drummed out of the Army. When Major Hook died a couple years later, his estate sold his collection, and the Osceola artifacts were purchased by Captain John Casey. Casey was an Army officer much friendlier to the Seminoles. He was formerly in the Second Seminole War at Camp Izard, and later became Indian Agent in Florida after the war in 1849. He fluently spoke the language of the Seminoles. (I don’t know if that was the Mikasuki, Creek, or both.) He was also a good friend of Billy Bowlegs. Casey was afflicted with Tuberculosis and died in 1856 in Florida at age 47. The Osceola artifacts that he had disappeared. I hope he returned them to Billy Bowlegs or the Seminoles? Now Dr. Weedon can be remember as not only as a co-conspirator in the plundering of Osceola’s body and personal items, but as being the cheapest doctor money could buy for the Army.